Alcoa wheels are built on innovation. Featuring durability, strength and reliability to provide a long lasting product that provides reduced weight without compromising strength. Alcoa is the expert in aluminum technology, since 1888 Alcoa has been in the business of innovating with over 8000 patents ranging from aerospace to construction. With a technical center based in the Pennsylvania, Alcoa operates the worlds largest light metal research and development facility. Alcoa has a global network of scientists, engineers, and technicians operating in over 30 countries. Learn about the entire lineup of Alcoa Wheels available at Pete’s Tire Barns. With a full selection of wheels to fit many different kinds and brands of equipment, we are sure to have what you are looking for. Our one-piece design eliminates welds that concentrate stress where fatigue cracks can start. Forging also aligns the metal grain in a uniform direction along the contours of the wheel, increasing strength. 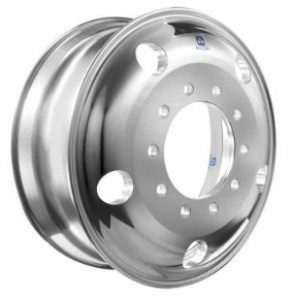 No painted steel wheel can match the luster of Alcoa aluminum wheels for your light truck, SUV or trailer. Naturally corrosion-resistant. No sandblasting, priming or painting — ever. Precision machined to ensure a smoother, truer ride. Both you — and your cargo. Aluminum weighs less than steel, lowering the suspension’s unsprung weight, which allows faster suspension response, a smoother ride and improved traction when cornering. We believe in our wheels. That’s why we offer a Five-Year Limited Warranty on most products. *These numbers are an average result based on tests completed at the Alcoa Technical Center.